Gaming laptops have taken substantial strides forward over the past couple of years by shrinking in size and scaling upwards in power. Despite this, their battery life remains negligible to sustain hours of heavy gaming and they aren’t (yet) capable of overtaking the abilities of a gaming PC because of the sheer number of components cramped into a small form factor. However, if you spend a considerable amount of time travelling and prefer the portability, then this is where a gaming laptop shines. You can effectively boost the user-friendliness with a variety of accessories to balance out the lower specs of your hardware. 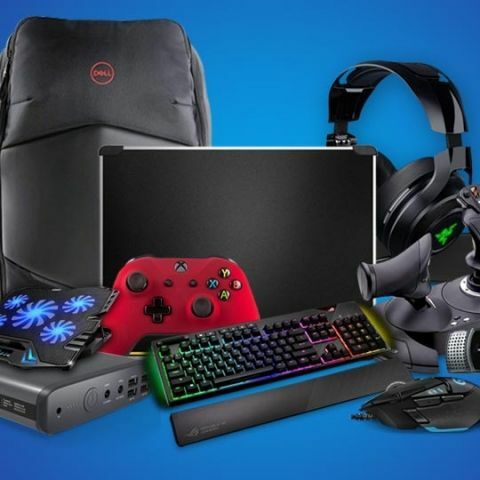 Enhance your laptop gaming experience with these accessories. Ask any gamer if they can fathom playing a first person shooter game on a laptop’s trackpad? The answer will almost instantaneously be a resounding no. This is probably one of the most essential gaming laptop accessory that will enhance your gameplay. 2018 was a great year for this category and produced some winners. A few examples include the Logitech G502 Hero, SteelSeries Rival 600, Corsair Dark Core RGB SE and more. Sound is an extremely vital part of gaming, because how else will you submerge yourself into the virtual world or pinpoint the exact position of your enemies? Gaming laptops do come with inbuilt speakers, however, they cannot match the experience a good pair of gaming headset can provide. A few exemplary gaming headsets of 2018 are the Razer Man O’ War, Logitech G Pro and the Kingston HyperX Cloud Alpha. Adding an external mechanical gaming keyboard to your laptop can breathe new life into it. Laptop keyboards are often criticised by gamers for not being very accessible and ‘clicky’. Gamers usually crave for mechanical keyboards with customisable macro keys, and they wouldn’t say no to some good ol’ RGB lighting as well. Some of the best mechanical gaming keyboards of 2018 include the Asus ROG Strix Flare, the HyperX Alloy Elite RGB, the Corsair K63 Wireless and many more. An added bonus? They make your setup ‘LIT’ (geddit?). A universal fact? Built-in webcams, in possibly even the best gaming laptops, usually stink. A webcam is an essential and indispensable part of a streamer’s arsenal. Streams that include facecam footage are usually more popular. Plugging in external webcams is essential for a streamer since they usually sport excellent image quality and resolution. A few great examples are the Logitech C922 Pro Stream, the Razer Kiyo and the Razer Stargazer. Gaming on a laptop can be quite the drain and you’ll probably not have enough power backup should something important come up. If you want the luxury of not having to hunt for a power socket in such times, get a power bank for your laptop or as it’s more commonly known, a portable gaming charger. There are dozens of portable gaming battery packs or chargers that can give you a few extra hours of backup but we don’t advise gaming while using these portable chargers. Few examples of portable gaming chargers are the MaxOak K2, the Sandberg Powerbank 20000 and the Poweradd Pilot Pro2. Overheating is one of the most prevalent issues in a gaming laptop. This is largely expected since cramming a powerful multi core CPU with a capable GPU in the compact body of a laptop is bound to exhibit excessive core temperatures and noise. However, cooling pads can function as a convenient and elegant solution for this issue by providing good airflow, increasing heat dissipation and doubling as a laptop stand as well. A few capable examples include the Cooler Master Storm SF-17, the Tree New Bee TNB-K0025, the TopMate Cooling Pad and more. If you are a gamer who prefers controllers over a mouse and keyboard setup, gaming controllers are a must-have for you. Additionally, the cost of a capable controller is often lower than the overall cost of a keyboard and mouse. Many console players swear by the control and accessibility controllers provide you when gaming. There were a few stellar controllers released in 2018 which include the Xbox Wireless Controller, the DualShock 4 Controller, the Scuf Infinity1, the Steam Controller and the Razer Wolverine Ultimate. Contradictory to popular belief, joysticks aren’t just great for flight simulators. In fact, they can work well for a wide variety of games, including some FPS games where you are able to jump into a jet or helicopter. These offer enhanced precision and realism than the likes of the experience provided by mice and keyboards. Some great joysticks that can be a capable accessory to a gaming laptop include the Thrustmaster T-Flight Hotas X Flight Stick, the Logitech WingMan Attack 3, the Saitek X52 Flight Control System and more. Gaming laptops are usually exorbitantly priced which calls for the best possible backpacks to provide enhanced protection. Gaming laptop backpacks come equipped with additional features that are absent in their ordinary counterparts such as weather protection, water resistance, extra padding and more. Some of these even include battery packs to provide your devices with some extra juice. A few good examples are the Dell 50KD6 Gaming Backpack 15, Acer Predator Utility Rolltop Backpack and the ECEEN 7-Watt Solar Backpack. If you have expended considerable money on a good gaming mouse, it makes sense to pair it with a mousepad since not all mice work well on all surfaces. Additionally, mousepads are becoming quite exhilarating functionally and visually by the addition of wireless charging and RGB lights in several models. The best of 2018 include the Corsair MM600, the Corsair MM1000 Qi (long delivery times) and the SteelSeries QcK Prism. Often, a wrist rest is an accessory that is easily overlooked since you do not actually know that you require it until you try one out. However, for gamers that spend hours on their laptops, it proves to be an invaluable asset since it elevates your wrist to the optimal level and gives you the support you require to avoid strain to the wrists. A few examples of good wrist rest pads include the Gimars Wrist Rest, the Aelfox Wrist Rest, the 3M Wrist Rest and the Glorious PC Gaming Master Race Wrist Rest. Do you want to expand your gaming hardware know-how? Go ahead and check out the best gaming panels for your gaming style here. We give you the lowdown of the different kinds of LED displays - TN, VA and IPS, as well as OLED displays and list out the pros and cons of each type of gaming panel.